Solfegacy is all about our guests' opinion, about their experience at Solfez Villas. No matter what we might say or write, it is their valuable feedback, observations and critique, which authenticate and drives us to the refinement of our services. In this section you will be able to read all about us, as our guests experienced and expressed it, either by leaving their comments here, or on other review websites, like Tripadvisor. A warm hearted Thank you to all of our Guests! Please click here to post your comments! We visited Elounda and the Solfez VIllas Complex at the end of August 2016 with our 5 year old son and another couple. The scenery as expected was breathtaking. It is a bit tricky to reach the Villas, as on a high and very slopy uphill rural road, but the sighposting was great and easy to find otherwise. Upon arrival, Ippokratis was there to greet us and give us all the necessary details for our booked villa and its amenities (first aid cabinet, safe, ironing and cleaning facilities, bbq etc). The extremely impressive high point was the plethora of fresh produce and other products that were there for us to use: from the organic and localy grown vegetables (oh my the divine smell of fresh cucumber and tomatoes), the local meat, honey and wine to the cupboards filled with more than we needed! This was a definite first! What a quality welcome! Ippokratis was of great help with any info needed from local tavernas and bars to supermarkets and pharmacies. He was always discrete and respectful of our needs and available times. Ippokratis was the one to suggest an amazing hidden treasure with the most attentive, charming and great chef that treated us like family and cooked everything on his own from fresh and the vast majority was his own produce. I will not spoil the surprise and give the details. You need to go to Villa Solfez and ask Ippokratis yourselves! The Villa was clean, modern and well maintained; the same applies for the pool and the external areas. Even the very few minor issues that we had were resolved quickly and adequately. We had regular cleaning service and that meant no hassle for us (it seems that a lot of people are concerned about this when thinking of renting a villa; definitely not an issue for Villa Solfez). Our boy enjoyed the pool so much. We could wake up and have some fun pool time, then breakfast and more water fun, then go out and visit local beach; return at the end of the day and go back for a swim and enjoy a drink and dinner! A private pool is a must for a villa and Villa Solfez has set the bar quite high. The villa itself has been well built and thoughtfully designed with views at every level across the beautiful Mirabello Bay. There are no words to describe the emotions when you are in the infinity pool enjoying a cooled drink and overlooking such stunning views. The serenity and calmness are priceless. It was very reassuring that the other villas had no access or view of our villa and its external grounds, so our stay was very private and comfortable. There are so many places to visit from the near Elounda village and Plaka to Agios Nikolaos and its lively centre. Definitely go to Vai and Ieraperta areas, a bit of a drive but with some great beaches, restaurants and locations. The only glitch that we had was the amount of mosquitoes that we had on the first night and even though that the Villa had all the necessary mosquito 'fighting' equipment and solutions, our boy and myself ended up with tens of bites some of which got infected. It was easy to access a pharmacy to get the necessary treatment and Ippokratis had given us info re the local doctors. From the second night and onward we were better organised and vigilant, hence no other issues. The view upon arrival at the villa was breathtaking, you can spend hours staring out across the sea. The accommodation was fantastic - very clean and had an open plan space on the main floor. The villa was modern and had a very well equipped kitchen including washing machine. We loved using the BBQ and spent every day in the pool which was kept very clean by Hippo the villa manager. It was great to vary meals across the two different outside eating areas and enjoy evening BBQs looking out over the sea and landscape. The villa is very well positioned offering a short drive to Elounda (our favourite coastal town) and Agios Nikolaos, just a 15 minutes drive away. Access to the villa is up a well maintained driveway which has an incline but easy to navigate so you don't need a 4x4 to reach the villa. The villa was cleaned every other day and the welcome from Hippy was very warm and friendly. We would thoroughly recommend choosing this villa for your holiday in Crete. We had a wonderful 10 days at Villa Mi, the views are stunning and the villa was comfortable and clean providing everything we wanted. We were welcomed with wine, fresh fruit and other local delicacies. This is truly a place to relax and unwind in a well serviced environment. We booked this as a late holiday. But it worked out wonderfully. The villa is a good size but still cozy. The pool is lovely and the view is absolutely breathtaking. Warning the villa is at the top of a very steep hill so make sure that your car can get up it. I walked up the hill a couple of times but it was very very hard work. The area is lovely and hippo (the host) was very helpful and kind! Would definitely recommend. "A very nice villa and excellent service"
The Elounda Solfez Villa is a very nice villa located in the hills at Elounda. It has a stunning view over the bay. Very good service, food and drinks in the fridge at arrival :-) Would recommend this. Stayed at Solfez Villas with my husband and grown up children for a week in June and it was, as the title says, amazing! The villa has everything you need and they have thought about the little things such as providing dishwasher tablets, tea, coffee and sugar etc... No need to immediately start charging round for supplies! Without doubt, the best thing is the view, spectacular! We have been to this area of Crete many times, so we just enjoyed lazy days by the pool and spending quality time together. From the moment we booked, we were well taken care of by Nikolas who communicated with us regularly - nothing was too much trouble. Hippo was on hand throughout our stay and made sure our pool was always pristine. We had a lovely time and it was excellent value for money. I wouldn’t hesitate to recommend these lovely villas. We loved our stay at the Elounda Solfez. It was our very own little paradise. The villa was lovely, with everything you could need and Hippo was a great host. He was very friendly and helped us with anything we needed. The outdoor space is amazing, and very private without feeling secluded. You almost don't want to leave your villa. You would prob need a car or it's around 10 Euros in a taxi to Elounda centre (we took taxi's) as the villa is up a very steep hill, but worth it when you get there for the peacefulness and the spectacular sea views! The pool is cleaned daily and the villa every other day so that was also a nice touch. We would definitely go back. Thank you for providing such a great experience! Ein ziemlich steiler Hügel führt zu mehreren Villen über der Bucht von Elounda. Aus allen Zimmern ein phantastischer Blick. Allerdings schwer zu finden und man sollte sich außerhalb verabreden vor allem nachts hat man sonst keine Chance. Google kennt die Straßen nicht!! Sehr netter Empfang von Kostas und Nicki! Viel Ruhe und Erholung möglich, allerdings etwas außerhalb und natürlich die Auffahrt ist nichts für Feiglinge. Sonst sehr gepflegt und ein schöner Pool. Zimmer sind etwas klein. Aber so eine Aussicht hatten wir bisher noch nie. The 3 bedroom villa we stayed in was one of a number of linked properties on a steep hillside. The description and photographs on the website give an accurate impression. However no photos can do justice to the location and views which are magnificent. We were met on arrival by Hippo who showed us around the property, and was on hand throughout our stay if we needed advice or help with anything. The information pack on the area with recommended restaurants etc is very good. The centre of Elounda is a 5/10 minute drive, so a car is essential. The only thing that went wrong during our stay was missing the turning down to the villa from the main road on our arrival. The villa sign had been taken down. This is a wonderful part of Crete. The property and the area both highly recommended. High atop a hill 7 perfectly situated villas awaited me & hubby, mother & 2 preteens for a week. Met by our lovely host Hippocrates with a tour, wine & fruit basket. The listing, pictures and descriptions are spot on. Tri level with sea views & AC everywhere . Bottom floor 2 bedrooms, washer & dryer, full bath and access to infinity pool, loungers, bbq & seating for six. Main floor, living room with sofa sectional, tv, phone, wifi and fully functional kitchen with all the bells & whistles along with outdoor terrace with seating for 6. Upstairs queen ensuite master with private terrace. Pool cleaned daily, and cleaning services provided every other day, with no intrusion and always a gift of some fresh fruit & veggies from their onsite garden. Elounda & beaches shirt car ride & car is needed to get around. Thank you to Hippo and the staff for our most relaxing and memorable bucket list trip. The villa is lovely, the pool a great bonus and the views wonderful. It is up a very steep hill but if you can manage that in a hire care them you are rewarded. Hippo the manager is a great guy, very friendly and helpful. We thoroughly recommend this place. The villa is in an idyllic spot high on the hillside overlooking the bay of Elounda. The apartment is spotlessly clean , well-equipped and spacious for a family of four with two teenagers - Wifi is (of course) a blessing ! The combinations of poolside sunny and shady areas, the main balcony outside the living room and balcony outside the master bedroom meant we all had somewhere to chill out. As people have said before, the road up to the villas is "fun", but to be fair provided you take a moment to check it is clear before sitting off and stay in first gear without hesitating, it is not a problem at all. A car is essential but the relative isolation of the villa being its attraction. Elounda and all of its restaurants, shops, etc are only five minutes away. The villa was fantastic, facilities as advertised, the view was incredible and our host Hippo was very welcoming and helpful. It was great value for money all round and we'd definitely recommend it to others. There's a song by 'Faithless' called 'Feelin' Good'. It opens with the line 'I want the view from the top of the hill, give me the view from the top of the hill'. I sang it to myself every morning when we opened the shutters at Villa Fa to reveal the stunning HD panoramic view of Mirabello Bay, stretched out like a picture postcard. It's the best view in Elounda and a view could never become tiresome. The colours of the Cretan sea changing throughout the day as the sun curves across the sky, painting the rocks red in the evening. Watching the yachts, tall ships, jet skis and fishing boats weave patterns with the white wakes they leave behind and just to the left, the majestic mountains of Eastern Crete rise from the sea. What I'm trying to convey is that Villa Solfez was good for the soul. We travelled as a family of five and arrived to a warm welcome from Hippo, our host. Hippo could not have done enough for us throughout our stay. He brought us fresh fruit, cleaned the pool every day, advised us where to eat and came to say goodbye when we (very reluctantly) left to travel home. The villa itself is beautifully presented and spotlessly clean. Maids arrived every other day to clean, change towels and make the beds. Well appointed too, there was nothing we felt was lacking. It had everything we needed and felt like home straight away. The outside living areas are designed to make the most of the superb views on every level. We breakfasted each morning on the balcony and enjoyed the Charcoal BBQ by the pool. The villa was such a place of calm relaxation that we spent our entire first week there, only leaving to eat in the evenings! The infinity pool provided welcome refreshment when a break from sunbathing was needed for the adults. The kids splashed and played in the pool from morning until evening. They loved it! When we did eventually venture further, we found some real Cretan gems. Almyros beach, Agia Fotia, Fourni village and Spinalonga were all highlights. Elounda itself is a beautiful place with a picturesque harbour full of tiny blue and white painted fishing boats. We found some great places here to eat and relax in the evenings. From our first enquiry to Nikolas the owner, to our departure home, we have found the team behind Elounda Solfez Villas to be friendly, helpful and attentive. They truly thought of everything and made our holiday experience relaxed and carefree from the moment we booked! Providing us with arrival and departure details, car hire recommendations, things to do and see, where to eat all made for a completely stress free holiday. When you find a piece of paradise and have experienced something so wonderful and good for the soul, it's tempting to keep it to yourself!! Having resisted the temptation, I cannot recommend Elounda Solfez Villas highly enough. This villa represented fantastic value for money. If you're looking for a place to unwind, relax and forget about the daily grind, then this is it. You will leave refreshed, inspired and transformed - Value for money doesn't really come into it - our experience was priceless! We came to Elounda Solfz Villas for a 10 night summer holiday and did not want to go home! We loved this place! Hippo and his team are superb, nothing is too much trouble and the service he provides is thorough yet discreet with a daily pool clean and maid service every other. The villa was spotless on our arrival and Hippo was on hand to settle us in; anything we requested was happily dealt with throughout our stay. The villa itself has been well built and thoughtfully designed with views at every level across the beautiful Mirabello Bay. The outside is spacious and well furnished with plenty of room for swimming and sunbathing, a shaded area together with a large brick BBQ which we used frequently. The town of Elounda is delightful and the local people so accommodating! Lots of lovely places to eat, drink and be merry. We spend an absolutely wonderful week here. The villa is fabulous and is well maintained, with an amazing view and wonderful pool. Nikolas was very attentive and provided excellent support and service throughout our trip. We were looking for nice villa maybe two months... when we finally found this offer we could not believe that for such a price we could get such a nice place. However the pictures and reality is not the same. Reality is even much more better... Once you enter and see this amazing view to whole Elounda from your infinity pool - it is just amazing. hotel with full service, however now we do not regret it since in villa you have your privacy and Nikolas helped to us anytime with anything we wanted. I really appreciate that anytime we called him he came to our villa and bring to us anything we needed. In addition, every second day there is cleaning service and every day they clean pool. We stayed in three floor villa for 6 people - every floor has own terrace. I would really recommend this villa to everybody - families or group of friends. I am sure you will not regret this. We had wonderful time in villa and we would like to thank you to Nikolas for everything. Just returned from a wonderful 2 week holiday staying at Solfez villas. The villa far exceeded our expectations - It was serviced and cleaned every couple of days and the pool was cleaned every day! The drive up the hill to the villa is a bit steep but it's worth it for the views over the fantastic Bay Area. Hippo and his team couldn't have done more for us, from leaving beautiful fresh vegetables from the garden, to guiding us to the best beaches. We would strongly recommend this place and look forward to returning! The villa delivered everything it promised and we could not fault it in any way. The location was perfect for us - just a five minute drive into town, but it was worth it for the view. It was really peaceful and we awoke to the wonderful sound of birdsong and the local goats which climbed the adjoining hillside every day - the gentle bleating and tinkling of their bells put a smile on our faces every morning. The first morning I was awake particularly early and sat on the balcony watching the beautiful sunrise - a perfect start to our holiday. Hippo was great - on call 24/7 should we need him and visiting each day to clean the pool. He also provided us with a lot of helpful information regarding places to visit. The maid service (every other day) was also most welcome as were the fresh vegetable and fruit they brought from the villas' garden - delicious! The pool was perfect as was the outside area and barbecue (the butchers in town sold the most amazing steaks) We did not find one restaurant in town that disappointed but can highly recommend The Ferryman, The Lotus Eaters, Porto Rino (wonderful pizzas) Olondi and Kanali for fish. Agios Nikolaos is definitely worth visiting for the day - for lunch, shopping and ice cream! Voulisma beach, about 13km from Agios Nikolaos is lovely - golden sand and beach service (food and drink) from the beach bar. Spinalonga is also worth a visit - we took the boat from Plaka, but were very disappointed with Knossos and did not feel it was worth the journey - we would rather have spent our time in the villa pool! We would love to return to Elounda one day and would definitely go back to Solfez Villas. Our review differs to the others as unfortunately we had to cut short our stay and return to the UK as our daughter became very sick. After months of looking forward to this trip, our daughter became unwell a few days before we left London. We thought she was recovering and would "turn the corner" in Crete, but she didn't. We stayed 5 days out of our 14 planned, but that was enough time to give this gorgeous place 5 stars! First impressions: steep road was absolutely manageable - we even got into 2nd gear once or twice! Also, as others have mentioned, the villas DO look exactly like the photos. We spent most of our 5 days staying at the villa (due to sick child) and our other two children didn't leave the pool, except to let the daily cleaning take place (always at the end of the day), then were straight back in! The cleaning of the villa (3 times a week) was also very welcome - changing all the linen felt a bit like a hotel service! We really enjoyed having the two outdoor areas to eat - just outside the living room/kitchen (good for breakfast) and by the pool. We literally couldn't get much else in the fridge when we arrived as it was generously packed full of fresh food. During the day, the view was fantastic, but for us the villa was spectacular at night. Firstly we were mesmerised by the colour of the moon rising - starts bright red, then turns bronze before becoming the usual pale yellow. We also used the BBQ most nights - brilliant. This along with the terrace/pool lighting made the outdoor space very special. We star gazed each evening (not possible in London!) and along with the view of Spinalonga lit up, we didn't want to go inside at bedtime! Probably what make our experience different is that we had fantastic customer service in a "crisis" situation. Hippo was amazing! Upon our request to find a doctor to see our daughter, he made a phone call and within 30 minutes a lovely doctor arrived at our villa, speaking perfect English and giving sensible advice. Unfortunately, our child's condition continued to deteriorate and we made the difficult decision to change our flights and return home. We then had a computing nightmare trying to print our boarding passes at short notice, which saw Hippo going flat out to help us on a public holiday long weekend late in the evening. He was a huge star and by some miracle produced our 5 printed boarding passes at 10 pm for us to fly the following morning. I can't express enough how grateful we are to him - he really went out of his way to help us. For us, he went beyond the call of duty - our problem became his problem too. We left Elounda very sad but knowing it was the right thing (our daughter was admitted to hospital once home). On our return we received an Email from Nikolas offering us a complimentary stay at the villas in the future to use up the 9 nights we didn't use! I can't think of customer service that compares to this anywhere else that we have been in 15 years of taking holidays as a family. Thank you Hippo and Nikolas! Nous avons passé deux semaines fantastiques à Solfez Villas. Malgré notre arrivée assez tardive, l'accueil d'Hippocrate était très agréable et les explications en rapport avec la location fort complètes. Il est d'ailleurs toujours à disposition pour vous renseigner ou vous donner de précieux conseils aussi bien sur les activités à ne pas rater que sur les restaurants incontournables ! A ce sujet ne manquez pas d'allez trouver Manolis au restaurant "Akrohoria" chez qui vous trouverez l'authenticité de la cuisine Crètoise (plusieurs visites obligatoires) !! La villa ainsi que la vue sont magnifiques, quant au service hôtelier il est de premier ordre: nettoyage journalier de la piscine, passage 2 à 3 fois par semaine des femmes de ménage, frigo et armoires garnis de victuailles pour plusieurs jours (viande, légumes, fruits, pates, riz, etc...). Nous ne pouvons que vous recommander cet endroit ! We had a great time in Elounda and in the main that was down to the stay in the Solfez villas. Hippo your host is very welcoming and knowledgable and can't do enough for you. The views make the place memorable. All you need is in the villa and it's clean. Perfect location too and don't be put off by the step hill to get to the villa - it's fine. The only reason I haven't given 5 stars is the pool is just a little on the small side and the villa is on 3 floors which does mean a bit of exercise going up and down. Would heartily recommend. This place was everything we had hoped for. The food was amazing, very Greek with lots of choice. The road to our apartment was steep so if you have mobility issues this isn't the place for you! Our 3 children had a great time at the pool and the games room. We hired a car which made our holiday as we could explore further afield. We did discover a lovely water sports place about 10 mins past Agios Nic which our children loved and the beach was lovely. (Much better than the local Elounda water sports and cheaper). We did try the Elounda once and almost got run over by the ferry that goes to the leper colony!! The apartments were basic but clean and we had an amazing view of the sea. Welcomed on arrival with full tour of the villa and as much information about the location and area as we needed. Hippo (crates) was very obliging and the full fridge/freezer/cupboard is a real added bonus - we only needed top up shops and drinks all week! Car is a must given the location up a steep hill but the climb is worth it for the views over Mirabello Bay. We just got back from a week at Elounda Solfez and had to give Ippo and the team 5 stars for a wonderful location, excellent facilities and service that was top class. True, the hill is a steep climb but we had small Yaris with four people and luggage and we got there fine. We liked Elounda a lot and there is no shortage of great restaurants. Highly recommend doing the boat trip to Spinalonga and getting up early to see the sun rise over the sea from the east. As all the other reviews say, the location makes for a very relaxing time away from the hustle and bustle. Excellent welcome and great view and own pool is fantastic. Great place for families and groups. Thanks to Hippo. We have just returned to New Zealand from a wonderful trip to Crete and the Greek Islands, a highlight of which was our time in Elounda at Solfez Villas. I "met" Nikolas Lygeros, the e-marketing manager for Solfez Villas by email back in June and by the time we arrived, I felt as though we were friends. He was the most obliging person to communicate with and there was nothing he would not arrange for us from a traditional Greek dinner party, to golf and spa treatments at the neighbouring five-star resort, to introductions to the best restaurants, beaches and tourist attractions. When we finally arrived we were delighted with what we found. Solfez Villas are absolutely stunning. Perched on the hill above dazzling Mirabello Bay on the north east coast of Crete, the villas are three-storeyed with balconies on each floor so every room has a spectacular view. The real value is that what you see on the Solfez Villas website is what you get, which is always our first concern when it comes to vacation rentals. We loved our private, gorgeous infinity pool and huge patio with an outdoor dining area overlooking Mirabello Bay, and their bio garden (next to the villas) where they grow Greek vegetables, which were delivered daily to us, free of charge. We arrived late in the evening after driving from the airport in the Cretan capital, Heraklion, to find Nikolas had stocked the fridge with fresh fruit, Cretan wine, cheese, bread, terrine, honey, nuts and other delicacies. It meant we didn’t need to try and find a place to eat at that late hour. Very thoughtful. The three-bedroom, two bathroom villa was immaculate and spacious, and had everything we needed including air-conditioning, a full kitchen and laundry, built-in BBQ, wifi, TVs/DVD/sound system. Cretan hospitality is legendary. The dinner Nikolas organized for us at the villa next door featured every Greek delicacy imaginable. On his recommendation, the next evening we dined at a modest-looking taverna in Elounda, just a short drive away. From the outside, Taverna Akrohoria presents as a humble, family-run restaurant with a few rooms to rent upstairs, but the food was fabulous and the view over the Cretan Sea and Mirabello Bay from the dining area was divine. Next day, Nikolas introduced my husband to the golf pro at the five-star Porto Elounda Golf and Spa Resort one of the top courses in Crete while my daughter and I met Elli, manager at Six Senses Spa, ranked one of the world's leading spas by Conde Nast. It was exquisite - soothing fountains, soft lighting, luminous pools, and the best massage I have ever had. Elounda itself is an interesting place. Its development began in the 1970s when the first 5-star hotels were established. Built on the hillside around a picturesque fishing village and beaches with emerald waters, Elounda is now frequented by celebrities, royalty and film makers. Restaurants and high-end jewellery and fashion shops abound but the village has maintained its slow-paced, rustic charm. Historic Spinalonga Island is just a short ferry ride from Elounda. The TV series The Island was filmed on there. The difference between a place like Solfez and a faceless resort or hotel is the personal touch and the warm engagement with guests who actually become friends. And it does not cost a fortune especially if you share the price with some friends or couples. We were there at the end of August and enjoyed day after day of cloudless skies. Elounda has everything - history, scenery, food, wine, beaches, and some of the friendliest people we have ever met. "Excellent! Couldn't be any better…"
We had the best time ever in the Villa Solfez! The location, the fully equipped villa, the pull and off course the view made it an unforgettable time for all of us, grownups and kids. Best hospitality we met, made us feel right at home - thank you! Just returned from a 10 day vacation at Elounda Solfez Villas and all I can say is AMAZING! Everything about this place is top class - the view, the property, the pool, the BBQ area, the facilities and the location. We travelled with our 18 month old daughter and our whole experience from start to finish was pure joy. For me, Elounda Solfez villas offer THE best views of the Elounda Bay and beyond and you can see them from your bedroom window. The road up is worth it for the view alone! Elounda is a fantastic base for a stay in Crete as there are a number of short day trips within easy reach and it is a culinary dream! The management team Nikos and Hippo could not do enough for us! We will certainly be back. We were extremely impressed with our villa, and after the steep car journey up the hill were absolutely delighted with it's secluded location and breath taking views. On arrival Ippo greeted us, he was very informative, helpful and genuinely a nice guy. The fridge was stocked with fresh fruit and we received a lovely welcome hamper including a bottle of wine, greek honey and other delicious treats! We had a very relaxing holiday, myself and my husband enjoyed relaxing on the terrace whilst the children enjoyed hours of fun in the well maintained infinity style pool. Everything you needed was included in the villa..... wifi, microwave oven, washing machine, hair dryer, iron and board, towels, air conditioning, bar-be-que, safe etc. It was like home from home! Elounda itself is a beautiful habour village, lots of nice restaurants and places to eat out ( and not a macdonalds in sight!). A boat trip to the historical island of Spinalonga is a must as too is a mountain tour on 'Ziggy's train'! A car is a must have if you are staying at these villas as they are a couple of miles outside of Elounda and as mentioned earlier regarding the very steep hill up to the villas. We looked at this as an absolute bonus.....so private, so very peaceful and a thoroughly relaxing holiday! We would highly recommend a stay at these villas. We stayed for a week between 25 July and 3 August. 4 adults 3 children. We had great expectations about the house and the place. The house is exactly as you see in the pictures. We were a little bit concerned about we read regarding the path to the houses. No problem at all. There is a road all the way trough, large enough and there is no risk at all. Any car even with full load will climb all the way. A piece of cake ! The house as said is exactly as shown. We found great food in the fridge specially the feta cheese. We will need to by some extras (milk, butter, bread, drinks..) but in general the food is enough for 6 during a week. The have a fabulous chicken. The vegs are also very good. The pool is ok with 2.0 meters in the deepest part and is cleaned every day. The water is clean and there is no sign of over use of cleaning products. The children used quite a lot without any problem. The AC worked just fine all over the house. They have a TV / DVD system with a very good sound. They had a excellent collection of CD's with Greek an international music. We enjoyed the Greek music that help to create an ambient. The wifi is fast and worked everyday. The house have also a great BBQ we used. We were received by Ippo at 2PM who was waiting for us ! Explained everything and is most helpful ! Gave us an excellent guide of things to do around the house. Great place to be ! Enjoy the house ! Avoid the restaurants in Elounda. Go to Agios Nikolaus. You will find better, more typical and cheaper places. All the city is full of nice shops to by food like fish or meat or fruit. Very nice restaurants surrounding the lake. Ask Ippo for advice about rests in Agios Nikolaus. Loved Crissy Island in July not so good in August. Take about 1 hour for ever 50km drive if you leave the Ieraklion <-> Agios Nikolaus main road. We had an eight-day stay. The owner was incredibly accommodating and made sure we lacked for nothing during our stay. The villa is BEAUTIFUL. When we signed the agreement, they told us what you see is what you get. I was skeptically, but it was true! The property seats on a hilltop and has an amazing view of the water and landscape. I stayed with my husband, our two boys and a friend. Everyone loved it! The boys enjoyed the pool and the gorgeous sites & beaches of Crete. We had a four-year old; management installed a safety net around the pool. Which insured no pool access to the four-year old, without an adult. The Wi-Fi had no connection problems. Housekeeping kept the villa clean during our stay. The fridge was well stocked with local produce, yogurt, cheese, and other eatables. The owner also recommended a number of restaurants. We tried them and they were all great! A welcome book listed the area's attractions so we had someplace new to visit each day. We really had an amazing stay! This villa was a delight. Beautifully clean and well furnished but the crowning glory was the terrace, which was large with a shaded eating area and an infinity pool with a jet for endurance swimming. The views from here and the master bedroom on the second floor were panoramic and breathtaking. I have never stayed at a villa that provided such a comprehensive and well-stocked fridge, freezer and larder, and we were treated to fresh produce from the owners garden. The two Ippos who looked after us were kind, helpful and could not have done more. The villa and pool is serviced daily. The area is wonderful with plenty to see and do and there were delightful restaurants locally, most notably “Akrohoria”, less than 5 min. drive from the villa, with mouth watering local cuisine and with most of the products being either the owner’s production, or locally sourced. The owner, Manolis, is a lovely man and the view from the terrace is outstanding. - We used the Barbecue a lot. - A pool perfect for relaxing and kids playing. - No disturbance from neighbors (It really doesn't feel like you have people close by as the houses are built in a way that you can't at all see into the terrace or house next door). The only thing that one should be aware of is that a car is definitely needed (not walking distance to Elounda village) and that there is a very steep hill up to the house. All in all: Guaranteed great vacation! Just spent 10days at the villas with our 2 small girls (1&3). Had a brilliant time and would thoroughly recommend. We spent most days around the pool and the girls had an absolute blast in a safe and secure environment. The air conditioning in each room was a life-saver with the hot temperatures outside. The villa was very well equipped with everything you need for a comfortable stay. We lunch and breakfast at the villa each day and then took our hire car down the hill into Elounda for dinner each night. This is our 3rd holiday in Elounda and really recommend the villa if you want to relax in privacy, with great views and all mod cons. The balcony at night was a perfect place to unwind once the children were tucked up in bed! We stayed at the Elounda Solfez Villas for five days during our honeymoon and it was a perfect getaway for us. The thing we were most grateful for is a calm that surrounded the villas. The area is very silent and let us feel solitude, even if there was a noise or music from the big hotels down the road, we didn't notice it. The villa has everything for a comfort living: fully equipped kitchen with a dishwasher and coffee machine, air conditioning, safe. The view from the bedroom and terrace on the second floor is stunning, especially in the early morning when the sun is rising, just like the one from the ground floor where a pool is located. The pool is not very big, but is enough for two people to swim comfortably at the same time, water is quite warm in the evening after the sunny day, and you can enjoy the view while swimming. Also, it's preferable to have a car, because the villa is located on the hill and may not be easily accessed by feet. Overall it was a very pleasant stay, we loved everything about it and the only regret I have is that we spent at the villa so little time and we'd be glad to come back. The villa was totally stocked with great local food. We loved the outdoor dining area including the fireplace. Views to die for! The staff were extremely helpful. THANKS! I stayed at the Elounda Solfez villa for 8 days with my wife, my 4yr old daughter and my parents. The villa is exactly as advertised. We were welcomed by Nikolas and he bought milk, juice and fresh fruit for the following breakfast. The villa is really clean. The rooms are perfect : 1 with 2 single beds, 2 with a double bed. The balcony on the second floor is ideal for breakfast or any meal near the Kitchen and the terrace is enormous. The pool is amazing and the garden well maintain. We really liked the view... Elounda is at 5 minutes driving. You need a car for this stay. We would definitely go back. We had a great stay here this summer. The welcome team and the help from the guys throughout our stay was excellent. The villa is kept really clean and is really well equipped for self-catering holidays. The views are spectacular and the villas are well designed so you don't overlook other villas and vice-versa. The local town Elounda is a 5 minute drive and a nice town to go out in during the evening. The villas are at the top of a really steep hill and are a little bit off the beaten track so you you definitely need a car (a good one!) to get to and from the villa. We simply fell in love with the place; the villa, the service, the welcoming and then more generally Elounda, its scenery, its lovely people and of course the food.... Magical. And what made it more enjoyable are the hospitality, assistance, care and availability of the management staff; Nikolas, Ippo... Thank you!! Always available; yet, invisible and respectful of your privacy.. We are "serial vacationeers" and can tell you that we have been around; so in comparison, if you're looking for peace, tranquility and at the same time the possibility to escapade... Solfez it! We stayed here for four nights recently and couldn't have been happier. Ippo welcomed us on the first evening with keys and full description of the villa: 3 bedrooms with a family room, kitchen, and our own pool! After a week of close quarters (i.e., small European hotel rooms), our family of four was grateful for the chance to spread out, make a few of our own meals, and relax. The villa was clean, very modern, and well laid-out. It had 3 levels, each with a balcony and/or patio, so you are enjoying the incredible views wherever you are. We didn't want to leave to go sightseeing each day. My one caveat: the villas have incredible views because they are built on a steep hill overlooking Elounda. Climbing the driveway in your car is not for the faint-of-heart! The basic drill is as follows... 1) Put your car in first gear; 2) Floor it! ;) and, 3) If there are cars coming down the driveway the same time you're going up, you have the right of way. We never did have to test #3, thankfully, but our little VW Polo did cough and even stall (twice) on this steep (1/2-mile?) stretch of road. A little harrowing, but we'd still stay there again because *every* other aspect of the villa was outstanding. We arrived at night and waking up to the most spectacular view makes an evening flight almost to be recommended! The villa is very modern, clean and very well thought out. The fridge was generously stocked with interesting local produce and unlike so many places we've stayed there's those very sensible little extras that make you appreciate your hosts - for eg dishwasher tablets so you don't have to go instantly and buy many more than you'll ever use. It's a small detail but it is an indication how much thought has been put into these villas. Great air con and wifi, dvds in every room which is great for the kids. Lovely pool kept tidy every day. Generous towels. A wonderful place to come to relax. There's even an epi pen in the first aid kit! I don't think I've ever been more impressed by a villa! The villas are situated on an east facing hillside in a quiet location with an unspoilt view over magnificent Mirabello bay which sets the scene for complete relaxation. Well equipped and comfortable with plenty of outdoor space there is little left to wish for in a holiday rental. The owner who lives on site went way beyond the call of duty to assist us in every way to ensure that our stay was as pleasant as possible and is to be highly commended. Situated between Elounda and Agios Nikolaos one is best catered for in terms of amenities, restaurants, beaches and nightlife, not to mention the ancient and cultural treasures of eastern Crete. The perfect place to relax, explore or just chill out. We certainly plan to return, highly recommended. One tip, first gear and heavy on the accelerator to negotiate the steep climb up to the villas. Very good villa and great hospitality. Fridge was full of tasty cheeses, olives, fruits and vegetables. There were everything we need to have good rest. Thanks to Nikolas for The file with places to visit. It was really great restaurants and beaches. Elounda Solfez Villa's are simply stunning. Look no further for a better experience. The Villa's are immaculate, with a welcoming relaxing indulging mood and a tasteful modern touch. The views are spectacular you will not get better than this over looking Port Elounda from high above. The quietness and serenity for when you want to unwind from a busy day, sightseeing, or just a relax is ideal. The caretaker was the best i have ever met, making himself helpful in anyway that was needed, ensuring that we still had privacy and relaxation time. I would vote the whole experience a 10/10 and would not hesitate on recommending these Villa's to anyone interested in holidaying in Crete. The only disappointment was leaving!!!!!!! Thank you for our stay! We could not fault the villa, the villa was very clean, the views were fabulous, Nikolas was very helpful and made us feel very welcome. The welcome pack we received upon arrival had everything that we needed, which was very much appreciated. We would definitely visit Elounda Solfez Villas again........10/10. A car is essential as the road up to the villa is extremely steep. We had a fantastic vacation at Villa Solfez which is quite comfortable for six people (including a two year old and a seven year old). The breathtaking view is a fabulous reward for the steep climb to get to the property. Nikos, the manager of the property, really makes a difference with his kindness, availability and resourcefulness (he suggested off-the-beaten path restaurants and sites to visit). These discoveries certainly added to the quality of our vacation. It is a worry-free rental: the house is cleaned every 2 to 3 days, the pool is cleaned every day. If you rent, you wont regret it. To wake up in the morning and see the sunrise through the large panoramic window at the foot of the bed was pure heaven! A very peaceful location (you don't hear a sound) with one of the best views in Crete! Elounda Town is just a few minutes away by car - and you DO need a car. Many people will not want to leave the villa but stay by the pool all day and then dine on the terrace overlooking the breathtaking Bay below. The villa was extremely clean with modern, quality fittings throughout. Luxury! The pool man arrived every afternoon. We are British but live in Athens and have recommended Elounda Solfez Villas to all our friends. We will certainly be returning. We will definitely go back! A well-maintained villa with a fantastic view of the bay. A perfect location for a quiet, relaxing holiday. The villa is fully-equipped and the management was very friendly, approachable and professional. My only advise is to have a car with an engine that can scale a steep hill to the villa. We visited Solfez Villas for four days with my friends. When we arrived we were all speechless! We couldn't believe it was even better than the pictures we had seen. The house was beautiful, the view amazing and the hospitality extraordinary! We arrived to a house fully equipped -even with fresh vegetables and fruit-, where every detail seemed to have been thought of. We were welcomed by Nikos, who was very helpful and kind and all of his suggestions excellent! The house is ideal for vacation, whether it is with friends, with family or couples, and the swimming pool from which you enjoy the beautiful view is so nice that you can stay there all day. Worth to mention that the pool is being cleaned every day! It was beyond my expectations and the hospitality we received is something I will talk about for years! The view is great, and the villa has two verandas, one of them by the pool. Free Internet, very good price. whether you are a couple, a family or Friends you can spend all your vacations at the villas. We did not want to leave the premises. We arrived at Elounda Solfez Villas in September of 2010 and stayed in a three bedroom villa for one week. We took advantage of the deal they were having where we received a reduced rate for staying a week versus or originally itinerary of 3-4 days. In addition, as part of our package, we received a fully stocked refridgerator and house wine. It was fantastic. The food provided was local to the area and fresh. Throughout the week, they restocked the food supply, so we were never without. The villa was clean and comfortable, although some of the beds were firmer than we would have liked. The villas are exactly as they appear in the photos, so no surprises there. The villa is laid out in such a way as to give everyone who stays there space to stretch out. The views from the villa were unobstructed and the sunrises over the ocean were amazing. The outdoor area was a dream. There was plenty of seating and space including an outdoor barbeque and your own private pool (poolboy included). The pool was a jacuzzi pool, but, unfortunately, it is not heated (for those people who travel in cooler months). Each villa comes with its own parking space, which is a must because you should rent a car in Crete if you are not staying in one of the major cities. One caveat, the rode up to the villa is steep, but worth the climb when you see the views from the villas. The manager, Nikolas Lygeros, was extremely helpful. Whenever we had a question, he answered us promptly, even going so far as to provide some of the items we requested, free of charge. Although we did not avail ourselves of other services, he also provides reservations, suggestions etc. It is almost like staying in a hotel. We had a wonderful time at Elounda Solfez Villas and we highly recommend it to anyone traveling to Crete. My hasband and I stayed in Elounda Solfez Villas for two weeks in July. And it was an absolutely amazing experience! Villas is a brand new. We found everything we need, even more. Fully equipped kitchen (meaning all) and barbecue, wich was nice to have dinner around the pool. Plus we could cook real Greek satad with organic vegetables from own small garden. M-m-m-m it's fantastic!!! Villas located less then 700 meters to Six Sense Spa and 5 minutes to drive to Elounda Village. The shops and supermarkets are full of delicious Greek food, from breakfast homemade yoghurt to fresh meat for dinner. Wonderful seafood resraurants in Elounda Village and nearest town Agios Nikolaus. Villas owner Nikolas was so welcoming and helpful offered excellent guidance on secret (non tourist) places restaurants taverns and beaches. Especially beaches, we haven't met a singl soul during whole day there. It was fantastic vacation! We have booked the villa for the next year and we just can't wait! The view is amazing! Especially the prospect from the level of our private swimming pool was unbelievable…every morning we were running into the pool before getting the breakfast. It was the best wake up! We had a fully equipped modern kitchen in our disposal…preparing food was never more relaxing and enjoyable! Actually the word “relaxing” was the key in our holidays and the property together with its unique location makes it true. We had so many things in our minds due to the wedding ceremony preparation before, and so we were grad to find a gateway like Elounda Solfez. As regards the honeymoon spirit of our holidays, just have a look over the images…it was a pity we didn't took many photos, especially from the decorated be. Θέλω να σας ευχαριστήσω προσωπικά για την υπέροχη φιλοξενία που μας προσφέρατε κατά τη διάρκεια της διαμονής μας εις τα Elounda Solfez Villas, (25//31 Ιουλίου, 2010), και να σας ζητήσω να διαβιβάσετε τις θερμές ευχαριστίες και τα συγχαρητήρια εις την Διεύθυνση του Elounda Solfez. Με ιδιαίτερη χαρά διαπιστώσαμε ότι οι εγκαταστάσεις είναι υπερσύγχρονες, η villa διαθέτει όλες τις ευκολίες που μπορεί να ζητήσει ο πλέον απαιτητικός πελάτης, μέσα από μια λιτή και σιωπηλή πολυτέλεια που απαιτεί το υπέροχο περιβάλλον. Οφείλω να ομολογήσω ότι είμαι από τις τυχερές πού κέρδισα στο διαγωνισμό "Μινωικό Ίχνος", ένας γρίφος πρόκληση, με διανόηση που καλεί τον συμμετέχοντα να ασχοληθεί για να τον λύσει. Συγχαρητήρια για τον εξαιρετικό γρίφο, που χάριν σ' αυτόν σας διαβεβαιώ ότι θα γίνω ο πρεσβευτής σας των villas Elounda Solfez. Επίσης θα ήθελα να διαβιβάσετε τις θερμές μας ευχαριστίες στο προσωπικό για την καθαριότητα της βίλλας και της πισίνας. Η ευγένεια και ο επαγγελματισμός σας ανταποκρίνεται σε υπηρεσίες υψηλών προδιαγραφών. Σας ευχαριστώ πολύ, εύχομαι ολόψυχα Καλή Επιτυχία και Καλή Συνέχεια! Me and my friend Theo stayed at one of the Solfez villas in Elounda for a week. We really needed to relax and that is exactly what happened , we RELAXED completely. The location is JUST PERFECT, so peaceful, such a great view that you do not want to leave from the place. The villa is fully equipped with whatever we would ever need on our holidays, the beds are very comfortable and so are the sunchairs on the terrace overlooking the beautiful gulf of Elounda. If you are looking for a place to relax this is THE PLACE!!!! 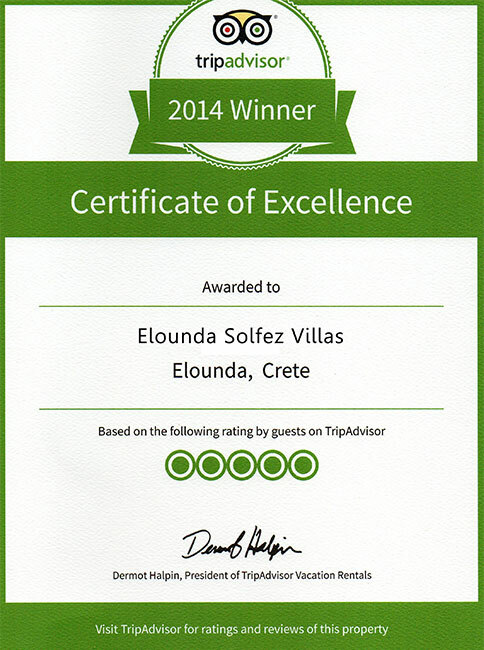 My family and I were honoured to be the first guests to stay at Elounda Solfez Villas. The properties are simply stunning, offering ample space both indoors and out. And the view over Elounda Bay is simply out of this world. The accommodation offers all the facilities you would expect, and a whole lot more you wouldn't, and there's even a Six Senses Spa in walking distance. I would highly recommend this place to anyone visiting Crete. I posted a review at http://www.aluxurytravelblog.com/2010/01/08/special-feature-elounda-solfez-villas-elounda-crete/ if you would like to read more.